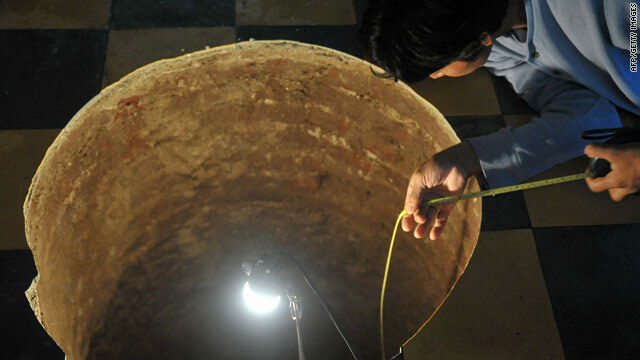 The sinkhole under a Guatemalan woman's bed is about 40 feet deep. "When we heard the loud boom we thought a gas canister from a neighboring home had exploded, or there had been a crash on the street," Inocenta Hernandez, 65, said in an Agence France-Presse report. "We rushed out to look and saw nothing. A gentleman told me that the noise came from my house, and we searched until we found it under my bed," AFP quotes Hernandez as saying. Hernandez told AFP that she is thankful the surprise under her bed wasn't any bigger. "Thank God there are only material damages, because my grandchildren were running around the house, into that room and out to the patio," AFP quoted her as saying. I have never used a photoshop program before, but I think I could have done a better job here. That story lost all credibility with such a horribly photoCHOPPED photo. Well, at least your passive-aggressiveness and spelling mistake has placed the world back on its normal course. I would not be surprised at all to have it confirmed that this shot is real. Sinkholes often look 'fake' in photographs. The way in which the tiles snapped along the curve of the hole is related to the 40 feet of cylindrical displacement. It doesn't just fall away. It's violently sucked downwards. People, it's not a sinkhole, it's a well. Hasn't any noticed the brick walls. Sink holes don't come prebuilt with brick walls! Yeah, I kinda noticed that too...probably just cemented over when the house was built. Has anyone thought this might be a black hole? Could easily explain the nicely cut off tile edges. Floor tile laid at ground level, no flooring or concrete, nothing, just tile. I,m not sure who,s taking the lead on wasting our time here,CNN or AFP. very fake. someone took a picture of a well and photoshoped a floor. forgot to put the floor filling under the tiles ha hahaha. Clearly you can count the bricks used to reinforce the sides of the well.